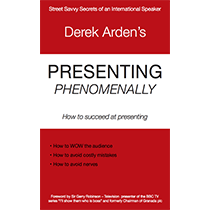 How to Present Phenomenally. Why so Important to your Success? How to Present Phenomenally. Why it is Important to your Business Success. Recently I was challenged to run a presentation skills masterclass in an hour for a FinTech bank. I managed to negotiate an extra 30 minutes which took it to 90 minutes for 11 people. “Impossibe” some people said. However as we know, nothing is impossible. The bits that went well in the time were the 1 minute presentations, the coaching and the tips. Not so well in the short period was some of the more advanced issues of the use and abuse of slides. Here is my report to the client for the future with my tips that are useful to others. When they want to make a difference in presenting. Objectives – Need to be very clear and repeated in the introduction by the introducer. Despite the invitation, some people won’t have read the brief carefully – so it needs to be repeated. By the introducer for positioning purposes. One minute presentations should be longer – say 3 minutes. I think they should be of a business nature next time. This will avoid the “stand-up comics” that went early. They were funny but had no real relevance to what we were trying to achieve. I felt they also might have intimidated the less confidence presenters. The presentations generally didn’t have an opening and a closing. These are the most important parts of any presentation or pitch is the opening and then the closing. Opening (1st Impressions – the What and the Why). Closing (the How) the call to action. The next move, meeting or the closing of the sale / persuasion piece or buy in. Power of three. Remember to emphasise the power of three in opening and closings. This cannot be underestimated in its importance. In the outline for the pilot – We agreed I would do some demonstrations of how certain techniques and how they could be used effectively. Slides, video, blacking the screen etc. Due to the time constraints, they fell between the devil and the deep blue sea. They should be removed to a more advanced session where there is more time and perhaps group led. Concentration times of audiences have never been shorter, particularly with Gen Z / Millenials. That is why using “pattern interrupts” such as power slides, edited video clips 10 secs, props, discussions, handouts at the right time can bring back the attention. It is the responsibility of the presenter / leader to do that. The demonstration of my slidedeck was a mistake in the short time we had, as I think it missed the point above. The feedback said some of the slides are old hat. It’s not the slide illusion; it’s the point you want to make with it, which I didn’t explain. Nerves and confidence. These go hand in hand when presentation. Some people suffer more than others. Proper use of quality slides will help, avoid death by powerpoint, assist the presenter and engage the audience. They will help with the handling of nerves and increase confidence.